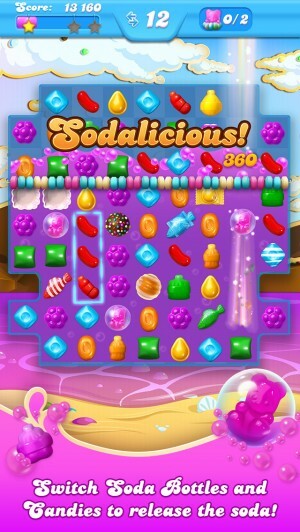 Love it or hate it, Candy Crush Soda Saga (Free) has made a fairly predictable march up to the top of the charts since its release not too long ago. That means tons of people are playing it, and knowing King’s games as I do, that means tons of people are getting stuck and wanting to toss their mobile device every time they hear that smarmy voice-over guy say, “Oooh". Well, as usual, I’ve spent a good bit of time playing the game since its soft launch in the sandy deserts of Canada, and I’ve got some advice to help you turn those “ooohs" into “ahhhs". Well, there isn’t actually an “ahhh", but you know what I mean. Persistence is possibly your greatest weapon. Sometimes, you just don’t get the pieces you need. Other times, you make a few bad moves and the whole thing is spoiled. But, as the great Chinese philosopher Confucius famously said, “I get knocked down, but I get up again, and you’re never going to keep me down". You’re going to get stuck now and then on certain levels. I was stuck on level 40 for a few days. The important thing is to keep on trying. You’re not going to let the game beat you, right? If you’re not sure where to match, go farthest from the source of the pieces. The usual match-3 rule is to match as low in the field as possible to increase your odds of subsequent matches. Candy Crush Soda Saga mixes things up by introducing the soda mechanic. The field fills with soda in some levels and effectively reverses the gravity. Keep that in mind as you’re making matches. If the board is filled with soda, you actually want to be making matches as high up in the field as possible. Don’t match pieces thoughtlessly. Make sure you scan the whole field before you make a match. Look for possibilities to create useful special pieces, or ways to set up bigger matches through the one you’re about to make. Most of all, consider if the match you’re about to make actually serves your purpose or is just going to waste a valuable turn. It’s easy to get caught up in the simple joys of matching, but you’re not going to get very far that way. Conserve your free premium goodies. The game gives you three lollipop hammers and 50 gold when you start. You’re going to want to use your gold to unlock gates later in the game, so do not use it to buy more hammers or to continue. Continuing oft loses both itself and the round, while buying hammers dulls the edge of your skills. Simply put, you don’t ever need either of these things to clear a stage, and getting in the habit of using them is only setting yourself up to spend some real money, which the title of this guide clearly tells you not to do. As for your three free hammers, save them for tough situations where they will unquestionably win you the round. As in, use the hammer, and you’ve won, don’t use the hammer, and you’ve lost. Even if you’re only two moves away from victory, hang on to that hammer for when it can make a real difference. Make the special pieces you need. Another thing that’s easy to get caught up in is making special pieces, and why not? They’re special! The thing is, they’re not always useful. It depends on the goal of the level and the layout of the board. 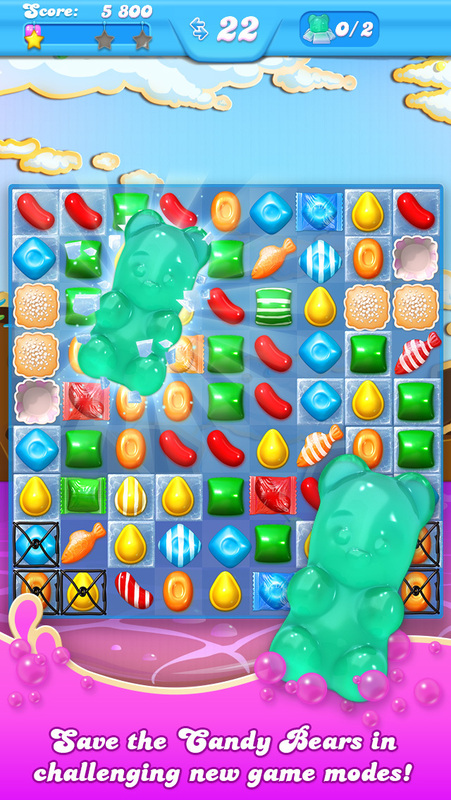 An exploding packaged candy isn’t much use when you’re trying to hit pieces on the other side of the board, and the gummi fish are almost entirely worthless when you’re trying to uncover bears in levels with tons of frosting. Even the almighty sprinkle candy is useless in certain situations, while a striped candy in the same context can be of major help. Match wisely. Striped Candies are created by matching four of the same colored piece in a line. Matching horizontally gives you a vertically striped candy that clears the entire column when matched, while matching vertically gives you a horizontally striped candy that clears out the whole row. These are extremely useful in most situations, though they’re not so great when you’re trying to hit a particular piece and they’re nowhere near it. They’re also completely blocked by licorice and of little use in levels that use it extensively. Packaged Candies are created by matching five candies in a T- or L- shape. When matched, they take out a 3 x 3 area. These are great for clearing out frosting or cupcakes, and generally produce great effects when combined with other special pieces. They’re a bit less useful when they’re nowhere near anything you need to remove, however. Gummi Fish are created by matching a 2 x 2 square of the same colored pieces. Matching these pieces causes a fish to swim out and attack another piece on the board. It will use some sort of priority in doing so, but as you can’t directly control the target, these fish can be a frustratingly unreliable ally. Still, in the right situation, this is a very useful special piece, and the ease of creating it certainly adds to its charms. If there are only a few prioritized possibilities, gummi fish can dig out pieces that might otherwise require a fair bit of luck to get at. Their weakness is in levels that have a lot of possible targets, such as those with thick frosting covering most of the field. Sprinkle Bombs are created by matching five of the same colored pieces in a line. These pieces are game-changers, as matching them with any other piece will remove all of the pieces of that color from the field. Don’t jump the gun too quickly on using them, however. If you can, keep it safe while you clear other pieces to set up the biggest possible blast. Matching this piece with any other special piece is basically a win button if you can pull it off. Color Changers are created by matching eight of the same colored pieces, with at least five of them being in a row. This is a tricky one to pull off, but the game will often put them in levels from the start for you to use. When you match this special piece with another piece, it will paint its own color onto all those matching the color of the piece you combined it with, wherever they are on the board. I found this piece overall less useful than the sprinkle bomb, but it can be a great way to set up a big chain of other special pieces. Striped Candy and Striped Candy will clear out all of the pieces in that row and column, regardless of the stripe orientation of the pieces matched. Striped Candy and Packaged Candy will do the same, but will expand the width of the blast to three rows and three columns. Striped Candy and Gummi Fish will send out the usual fish, but when it arrives at its destination, it explodes like a striped candy, taking out a whole column or row. Striped Candy and Sprinkle Bomb will paint all of the same colored pieces on the board with stripes and set them off, creating a giant Bomberman-style criss-cross explosion of death. Striped Candy and Color Changer will paint all of the same colored pieces on the board with stripes in the changer’s color, creating another big boom. Packaged Candy and Packaged Candy creates a larger blast covering a 5 x 5 area. Packaged Candy and Gummi Fish creates the usual fish, but when it arrives at its destination, it explodes like a packaged candy. Packaged Candy and Sprinkle Bomb will package all of the same colored pieces on the board and set them off, which is always glorious. 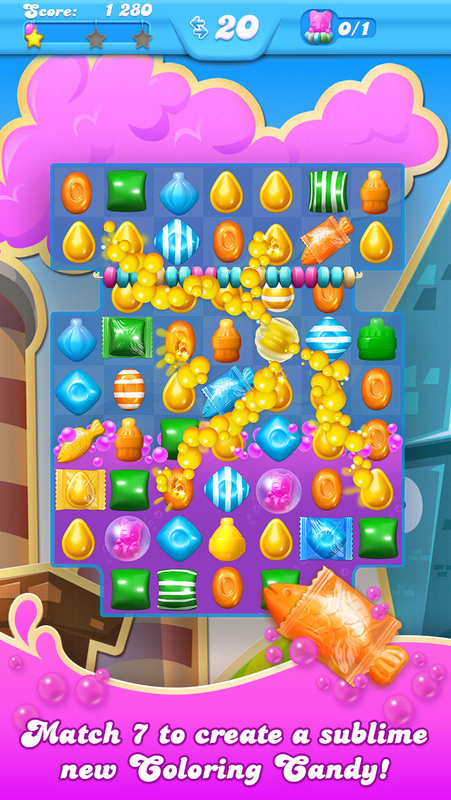 Packaged Candy and Color Changer works similarly, but changes the pieces into the same color as the changer. Gummi Fish and Gummi Fish sends out three fish that otherwise behave normally. Gummi Fish and Sprinkle Bomb turns all of the same colored pieces into fish and sets them off in probably the least effective sprinkle bomb combo. Gummi Fish and Color Changer behaves in a similar fashion, but changes the color of the pieces first. Sprinkle Bomb and Sprinkle Bomb is the BFC 9000, setting off a blast that hits every single piece on the field. Sprinkle Bomb and Color Changer has a similar effect. Your odds of being able to pull off either of these combinations are pretty low, but when you do get the chance, don’t hesitate. They’re both effectively stage clears in a single move. Raise The Soda Level. This level type tasks you with matching soda bottles to raise the soda level up to the top of the field. This a new challenge for Candy Crush. The bottles are often tucked away in hard-to-reach spots. Gummi fish and striped candies are very useful in these levels, while packaged candies are not all that great unless you can combine them with another special piece. At any rate, these stages are pretty straightforward. Just aim for the bottles as directly as possible and don’t waste moves on anything else. Always watch for potential gummi fish matches as they’re total game breakers in these stages. Eat All The Chocolate. Yes, chocolate is back and it’s still horrible. Chocolate will spread if you don’t remove at least one piece each turn. Packaged candies and striped candies will do you well here, with the gummi fish being less useful unless you can combine them with a striped candy. It’s absolutely vital to keep the chocolate in check. Focus on removing it and only deviate if the end result is more chocolate removed, such as with a packaged candy bomb. The chocolate is often roped in at the start of the stage. Consider leaving it there until you’ve set up a couple of special pieces. Raise The Bears Above The Candy String. This is basically a variation on the old ingredients levels from the first game, but instead of trying to move pieces to the bottom of the play field, you’re trying to move pieces up. That often means you have to raise the soda level first, so get to work on matching bottles, making liberal use of gummi fish to expedite the task. After the soda level is high enough, you’ll then want to switch your focus to removing pieces above the candy bears. At this point, vertically striped candies are your best friend. 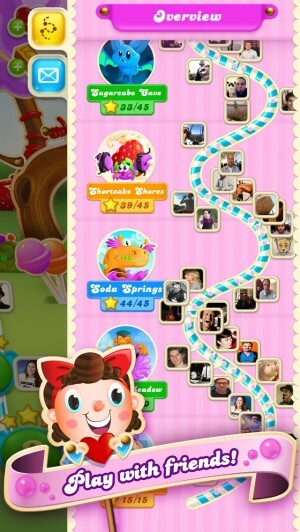 If you can position one in the same column as the candy bear, you’ll create a fast lane to the top of the screen. Gummi fish will also help here. As long as nothing distracts them, they will take out pieces above the bears. These stages often span multiple screens, so keep that in mind as you go. Find The Bears In The Frosting. Taking the place of the old jelly levels from the first game, these ones similarly have you trying to remove layers by matching pieces inside of the square. The aim this time around is to find all of the hidden bears scattered around the field. The layouts change each time you tackle the stage, so stages of this type can sometimes vary in difficulty with each attempt. Removing the top layer of the frosting is usually sufficient to reveal whether or not there’s a bear hidden underneath. You usually don’t have to remove every piece of frosting here, but your gummi fish are kind of stupid and will continue going after useless squares even if you’ve sorted out where all the bears are, so don’t count on them. Instead, use packaged candy bombs, striped candies, or best of all, combinations of the two to quickly take out as many squares of frosting as possible. Eat The Honey And Save The Bears. So far, these are the nastiest that Candy Crush Soda Saga has to offer. Basically, you have to uncover the bears as in the frosting levels, but honey works a little differently from frosting. While pieces or bears might be contained within the honey, it acts as a blocker until you’ve removed it completely by making matches next to it, like cupcakes. Worst of all, you can’t tell if a bear is inside until you’ve got it down to its last couple of layers, so you end up wasting a lot of time chasing shadows in these levels. Like the levels where you have to raise the bears, these levels sometimes span multiple screens. The only saving grace here is that the gummi fish aren’t useless the way they are in the frosting levels. They’ll actually seek out honeycombs with bears in them, giving you vital clues for where you should target. These levels are virtually all a tight squeeze so far. Every special piece is useful here, and you’ll pretty much need to make some combinations if you want to squeak past them. Those are all the tips I’ve got for Candy Crush Soda Saga for now. It’s a hard game, probably King’s hardest since Pet Rescue Saga (Free), but it’s definitely doable as long as you stick with it and put a little thought into your strategy. The advice in this guide should help you develop your techniques and rise through the levels like a candy bear in soda, only a bit less sticky in the end. Good luck!